Though Zodiac has been under the Fossil Group umbrella for some time now, we’ve been both surprised and impressed by a handful of the releases that have surfaced from the brand in recent years. On account of having surprisingly deep roots dating clear back to 1882 (though technically the name was only registered in 1908), the brand’s recent vintage-inspired tool watch reissues are of particular interest, having actual historical roots and offering quite solid value given their sub-$2k price range. 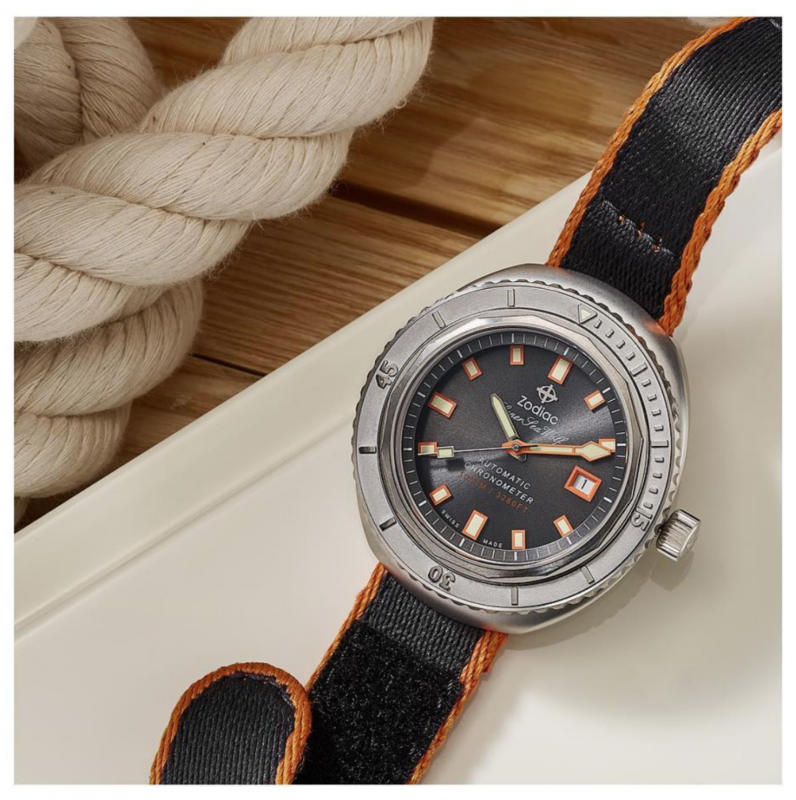 This past week, a new limited-edition variant of the Super Sea Wolf 68 diver was unveiled in celebration of the 50-year anniversary of the model, and instantly it outranked its siblings as the most desirable variant in the collection. The Super Sea Wolf 68 has a lot going for it, even in standard guise. Its chunky pod-like UFO case is a touch on the hefty side, measuring 44mm across by 49mm top to bottom (lug to lug would be inaccurate considering its floating lugs), and 13mm thick, it’s on the chunky side of the dive watch category, though still quite wearable. Its bezel has a very firm action to it, featuring a sprung mechanism that requires its wearer to press down on the bezel before being able to rotate to it. 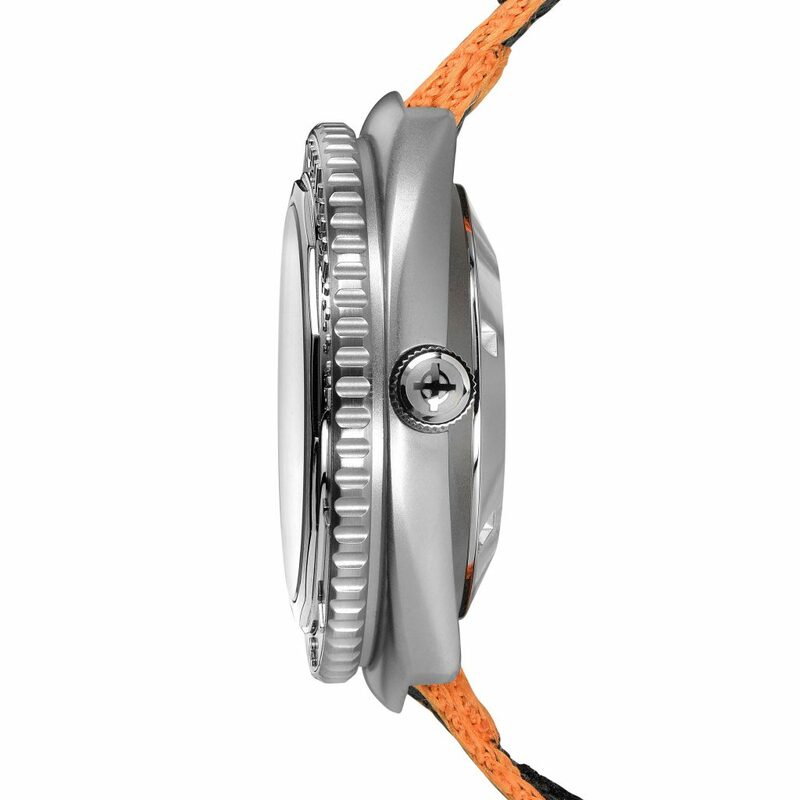 Regarding the bezel, this new limited edition model features a new bezel design that is machined with raised numerals. The indices and edges are polished, whereas the face of the bezel has a microblasted finish to match its case. Compared to the standard versions of the Super Sea Wolf 68, there are a few noteworthy details that help justify its $400 premium over the standard version (it’s priced at $1,995 rather than $1,595). Aside from its new bezel design we’ve already covered, Zodiac is also including all three strap options with the purchase of this new model, which is a new practice for them. 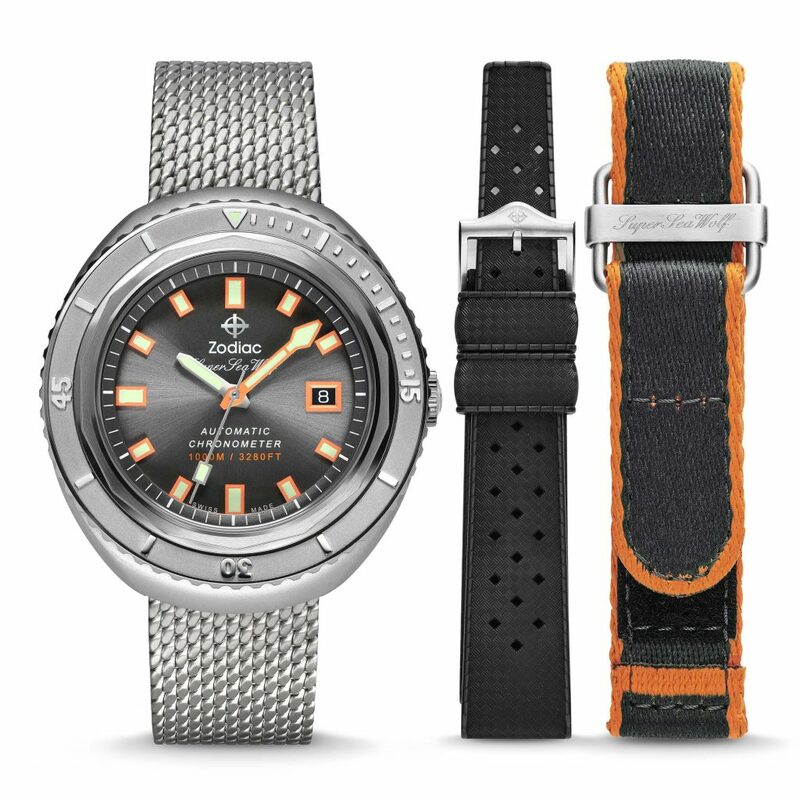 Owners of the new release will be provided with the mesh bracelet, a tropic-style rubber strap, and a very comfortable velcro strap with orange accents. Zodiac has fitted a higher spec COSC chronometer-certified caliber into this model. Known as the STP 3-13, this is an in-house manufactured caliber that is basically a Zodiac/Fossil clone of the ETA 2824. 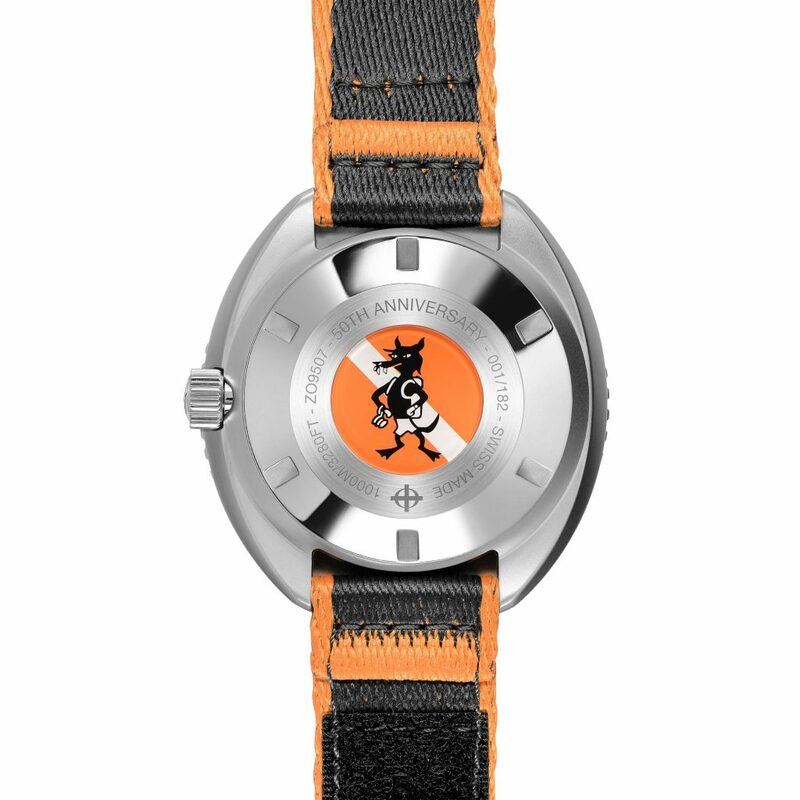 Standard models of this watch and other automatic Super Sea Wolf models generally use the non-chronometer STP 1-11 caliber. Having owned a couple of their watches personally over the years, I can fairly say that I’ve never run into any running issues or failures with the caliber. The last key talking point that sets the new release apart is scarcity. Only 182 examples of this anniversary edition are being offered, which means you definitely won’t be seeing them all over town. Zodiac’s production volume is quite low to begin with, as the firm churns out about 5,000 watches annually, so the count of 182 makes reasonable sense. That said, I also suspect that they took a lesson from their bronze version of this watch from 2016 where they capped production at 82, and somehow continue to have demand for the unique watch on any given day. As the Fossil group continues to struggle with its entries in the fashion watch space (which led to a mass layoff of roughly 40% of its US staffing), we hope the efforts with Zodiac are maintained. The brand has a vast archive of historical watches to draw inspiration from, and at least in the enthusiast sect, interest in the brand continues to grow.